As we have noted in our annual Best Games Not Yet Published, Critical Mass Games, Ground Zero Games, Rebel Minis and Khurasan Miniatures have all been producing some outstanding 15mm sci-fi miniatures over the past few years. 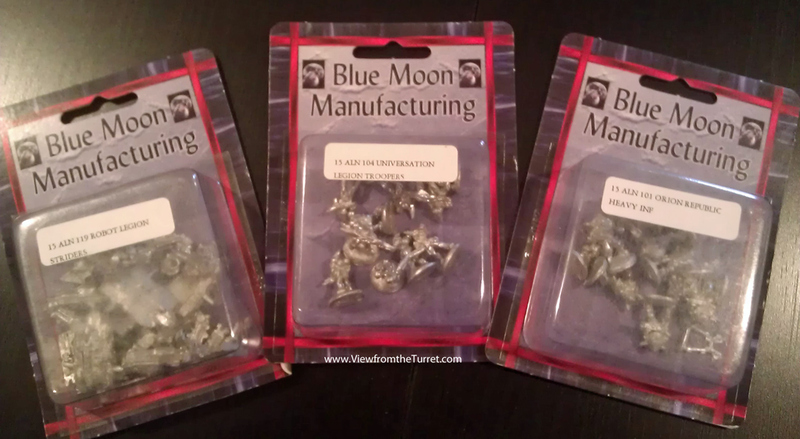 With the new release of the Galactic War 1 15mm sci-fi miniature rules by Blue Moon Manufacturing we became aware of yet another 15mm manufacturer. We decided to take a look at the new rules as well as some of the miniatures. We have only given the Galactic War 1 rules an initial read through. The rules are not bad by any means but if you are looking for innovation or comprehensive options you will need to go elsewhere. On the positive side what you get is a solid set of company level rules with some background fluff on the seven races of the game’s universe. The game scale is 100 yards per inch and each infantry stand is a fireteam and vehicles are based individually. The rules offer plenty of basics such as initiative based movement as well as spotting and command. Galactic War 1 covers infantry and vehicle combat and even handles things such as psychic combat, jump troops and more. The rulebook is an 88 page black and white softcover with full color cover and overleaf. There are a few nice illustrations and a few more uninspired photos of the Blue Moon minis in action (minus any terrain or buildings). The physical look is clean but unexciting. Sixteen pages of fluff are included along with an additional 36 pages of stats for the seven factions. The core rules themselves are about 16 pages long and, obviously, rather streamlined. Four pages of rules cover the basics of setting up a scenario/mission. A Quick Reference sheet and blank unit records are also included. 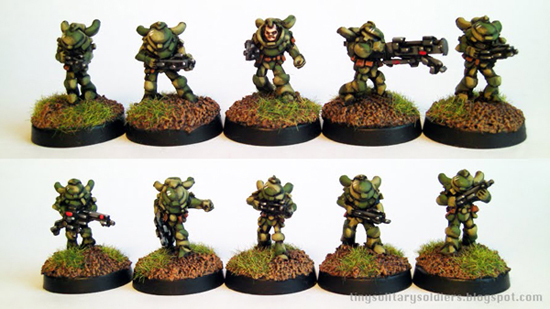 A perfect example of the fairly generic/streamlined nature of the rules are the infantry weapons. The only weapons included are: Primitive propellant weapons, Modern propellant weapons, Laser rifle, Plasma rifle, and Electro guns. There are also five other support weapons. There is a single mortar weapon in the game that has a minimum and maximum range and suffers no ill effects for range. This is not a huge selection to cover the various sci-fi genres and worse the differences between the weapons are actually rather minor. In fact the armor penetration of the Primitive propellant weapon is the same as that of the Electro gun. Range also affects all weapons the same. The rationale is that troop quality matters more than range. But in actual gameplay this creates some oddness. A Regular troop firing a Primitive propellant weapon at long range would have a -1 combat factor (added to a 3D6). A Veteran troop firing a Laser Rifle at long range would have a +1 CF (added to a 3D6). Not exactly much difference there for regular troops firing rifles vs veterans firing lasers (and the difference could well be even less if you assume there would be more stands of the Regulars). You simply don’t get a feel for real firepower nor any large difference in technology (especially with support weapons). This blandness extends even into the Special Traits (i.e. chrome). For example, the Jump Pack option simply adds 3″ to your movement and allows you to ignore intervening terrain (average infantry move is 4″ and if they do not attack they can move 6″). Again, this simply does not give one the feel for jump pack troops bounding across the map. All of this certainly does speed play and allows you to field multiple platoons without much problem but it seems you sacrifice a lot of flavor. Galactic War 1 also includes a unit design system. Here you can design your own custom units. Oddly this is where you will find additional unit options not mentioned in the core rules and thus you will be flipping back to and through this section a lot searching out the various special traits. It is these options that lend most of the flavor and real distinctions to units. The design system is straightforward and allows one to create everything from regular foot troops to psychic jet-packed armored jump troops and giant walkers. To be fair we have not played a game yet with the Galactic War 1 rules and the sum may very well be greater than the parts. But even though the rules cover many of the areas we like to see covered by sci-fi rules the overall feel is simply bland. The rules do not seem to convey that you are playing a game in a sci-fi universe with super weapons and super troops (let alone strange aliens). The feel is quite 20th Century. 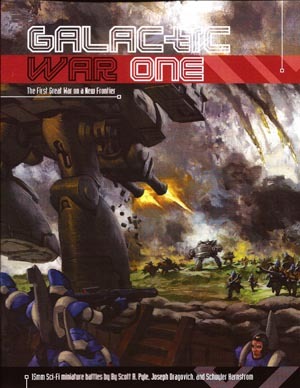 We do think Galactic War 1 is worth a look but have to recommend you consider Gruntz and Strike Legion first. 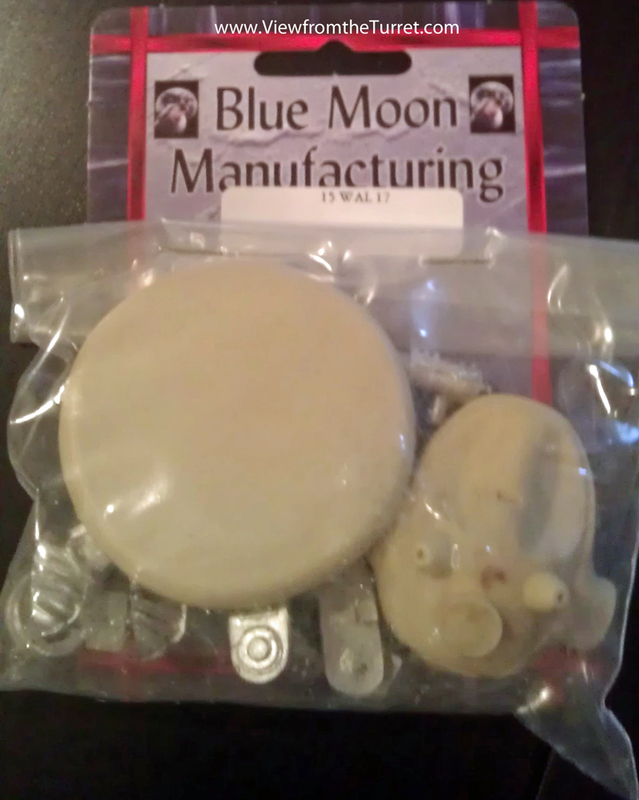 What pulled us in from the start were the Blue Moon Manufacturing 15mm sci-fi miniatures. Their infantry figures are top notch. They have over ten races/factions from which to choose and the detail and casting quality is excellent. The only downside is that the lines do not have much breadth with only about ten figures per faction. Thankfully these do include leader and heavy weapon troops. As you can see from the photo they scale well with Critical Mass figures, which tend to be the larger of all the 15mm stuff. Unfortunately, the vehicles do not meet the standards set by the infantry figures. The selection ranges from grav tanks to walkers. But, to us, most of the designs seem somewhat odd and the detail is a bit bland. 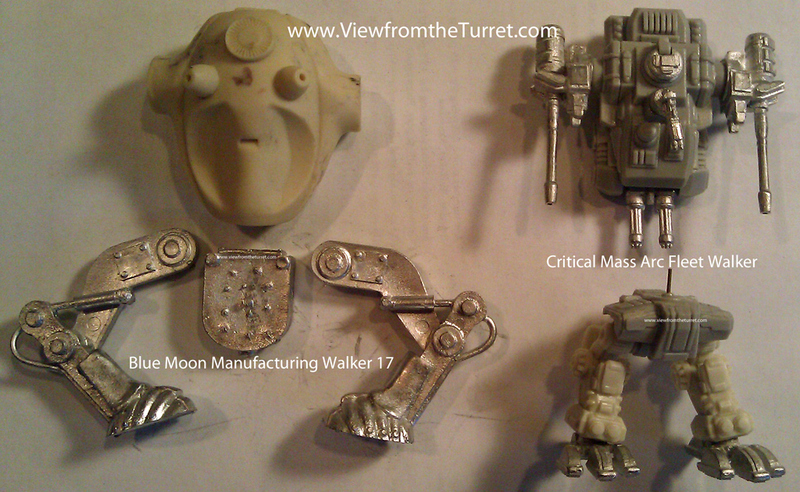 We did pick up Walker 17 and it is an impressively large model with reasonably good casting. But as you can see from the photo it pales in level of detail compared to Critical Mass walkers. But if you do happen to like the designs you will be happy with them and there is certainly a good selection. 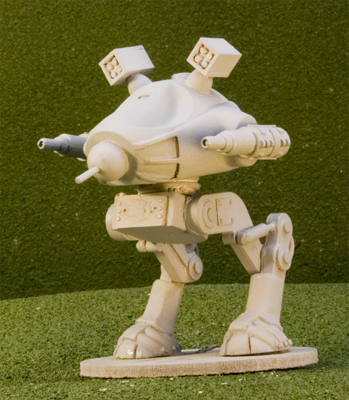 This entry was posted in 15mm, Miniature Wargames, News and Updates, Reviews, Sci-Fi.